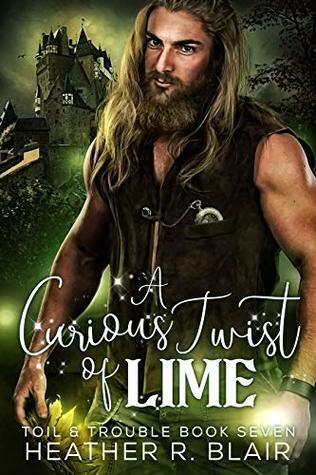 As a reader of the Toil & Trouble series, I have had a serious soft spot for Georg since the very beginning, and A Curious Twist of Lime FINALLY delivers with a formidable heroine for the growly, territorial and sweet-as-it-gets former bruin king. Alice was locked up in a faraway world as a very young girl by a man who she only knows as master. With books as her only real companions, she has a very sheltered, yet precarious existence. And then Georg appears and she finally has a means to escape her dreary life. Brough to his world of bruins, castles and court life, she finds that fitting in is an impossible task, and yet Georg remains by her side as her self appointed protector. Georg was once a minor bruin king of the new world, but after a complicated situation, he is now left without a purpose or real home of his own. Called to the court of the highest king, ruler of all of the bruins, he is asked to take his rightful spot as heir to the throne. Already unsure of his desire to rule again, his incredible attraction to Alice has him finally feeling like he has found a small sliver of what he has been missing for so long. But, Alice is a human, and his people despise everything about her kind. A Curious Twist of Lime is a book that completely tangled me up, made me weep and then warmed my heart all at the same time. Suspenseful, intriguing and utterly unforgettable, the impossible love story of Alice and Georg was paranormal romance perfection. Alice starts out as a naive young woman who has no useful knowledge of the outside world. Entering the bruin court, she is immediately judged as inconsequential and beneath them. Taking it upon herself to grow and learn, Alice slowly finds herself as more than a captive. She is definitely not what she seems, and with a little time, Alice proves just what a formidable woman she really is. Georg is someone we have all loved and felt for, and then missed incredibly when he lost a treacherous battle at the beginning of the series. Having him back was already a fantastic surprise, but getting to know him even more in this book was the best thing ever. He is fierce and protective, and with the softest underbelly for those he loves. Alice is such a unique match for what we thought we already knew about the bruin, but their love story brings with it everything that Georg never knew he needed.